Fifty Indian peacekeepers stationed in South Sudan have been awarded the UN Medal for their professionalism and service in protecting civilians and building durable peace in the conflict-ridden country. 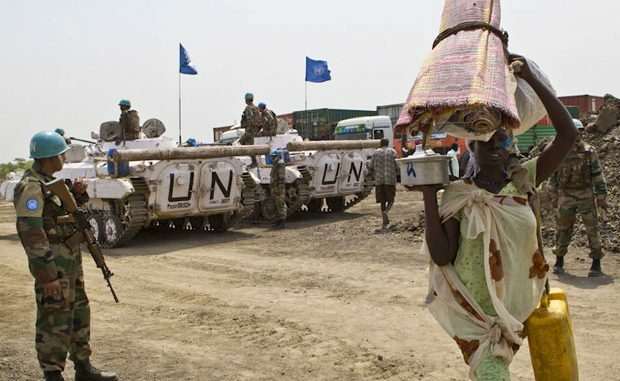 The Indian peacekeepers are part of the UN Mission in South Sudan (UNMISS). They are deployed with the Indian battalion stationed at Bor in the Jonglei region of South Sudan. They were presented with the award recently by UNMISS Force Commander General Frank Mushyo Kamanzi. Presenting the award, General Kamanzi acknowledged their contribution in carrying out patrols across the region as well as providing a safe and secure environment for the 2,500 civilians who have sought sanctuary at the UN Protection of Civilians site at Bor, a media release said. “I would like to thank the Indian battalion for their courage and professionalism in executing their mandate in Jonglei,” said General Kamanzi. The local government in Jonglei also paid tribute to the Indian troops. The Indian battalion had played an important role in keeping the community safe as well as encouraging local peace efforts, said Agot Alier, Jonglei Acting Governor. They had also provided much-needed services to the community outside of their core mandate, such as medical care for local residents and support for local farmers with veterinary treatment for their animals, he said in a media release issued by the UN. The battalion has been intimately associated with peacekeeping efforts and the battalion has supported the mandate of the United Nations and the overall peace process, said Alier. Indian Ambassador to South Sudan, Srikumar Menon, attended the medal ceremony and thanked the peacekeepers for their commitment and service. “India is committed to the objectives of the UN Charter and therefore is ready to support the United Nations’ peacekeeping efforts globally,” he said.